There are ghost towns to be found anywhere from the American West to Namibya to the Ukraine, but none have the distinct feeling of Villa Epecuen—an Argentine town that spent almost a quarter century under water. Flooded in the 1980s, only to be revealed by drought in 2009, the town now forms a corroded and bleached out landscape. Only one of Epecuen’s original residents remains, and you can take a tour of the town with him via the video above. Villa Epecuen, located about a 6-hour drive southwest of Buenos Aires, was once a bustling tourist destination. Visitors would come to the picturesque resort and bathe in the waters of the town’s lake—which many believed held therapeutic value due to its high salinity levels. In the 1970s the town was home to 5,000 residents and 300 businesses. But in 1980 rainfall began to increase in the region, and in 1985 the lake broke its banks and submerged Villa Epecuen under some 33 feet of water for almost 25 years. 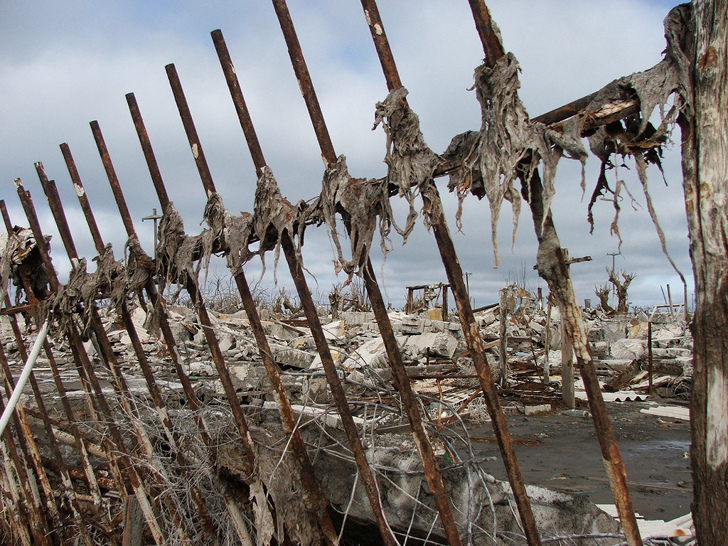 In the 2000’s, a twist in climate patterns brought drier seasons to Villa Epecuen, and at long last, the flood waters began to recede. A further shift brought drought to the region, and with it revealed the broken remains of a once bustling tourist resort. 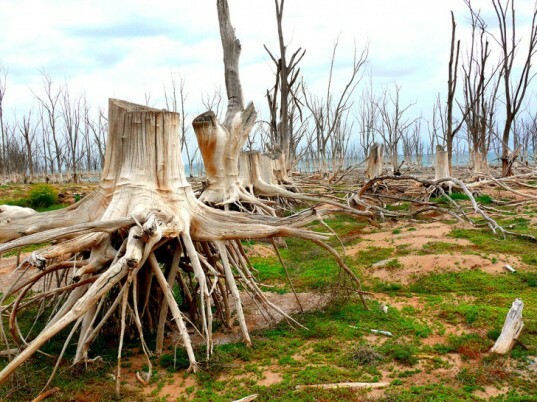 The high-salinity water had left both man-made structures and trees corroded and bleached out. The hotels and ornately appointed lakeside structures have been reduced to all but indistinguishable component forms, while the ground has been washed out beneath tree roots. The area is largely abandoned, as many of the residents fled as the waters rose back in the 1980s and relocated to the nearby town of Carhue. Only one of the town’s residents remains—living on the edge of his submerged home town.84-year-old Pablo Novak. Novak now greets curious tourists who come to visit Villa Epecuen, and provides tours of the town’s remarkable ruins. There are ghost towns to be found anywhere from the American West to Namibya to the Ukraine, but none have the distinct feeling of Villa Epecuen—an Argentine town that spent almost a quarter century under water. Flooded in the 1980s, only to be revealed by drought in 2009, the town now forms a corroded and bleached out landscape. Only one of Epecuen's original residents remains, and you can take a tour of the town with him via the video above.